With the whole Vegan movement gaining rapid momentum, there are perhaps few and far in between that are unaware of its growing popularity. While everyone is talking about foregoing animal products in foods and substituting them with vegan alternatives, have you thought about what’s the situation with packaging? Adopting a vegan lifestyle is not just about consuming vegan foods but also being considerate of their packaging. After all, packaging is as important an aspect of the product life cycle and something both brands and consumers need to be mindful of. The use of nuts & seeds to create product packaging is a pretty novel idea and unheard of until now. Isn’t it? Well, thanks to European plant-based foods company, Alpro, it is now a reality now. Alpro has managed to successfully create “the first plant-based takeaway meal served entirely in edible packaging”. Apart from offering a very believable plant based twist to a regular “chicken-n-chips” meal, they’ve invented an edible bucket made of a secret combination of seeds, spices and nuts to serve the meal in! Believe it or not, another way to create an eco-friendly packaging alternative to plastic is mushrooms. Yes, you read that right – fungus. Mushroom packaging has various advantages to its credit. Not only is it compostable at home and biodegradable at an incredible rate, it is also known to create circular economies through its reuse of waste materials. The idea behind this litter-friendly packaging by New York based biomaterials company, Ecovative Design, was to create something that wouldn’t harm the environment even if it did not make it to a trash can. Ever heard of edible spoons? 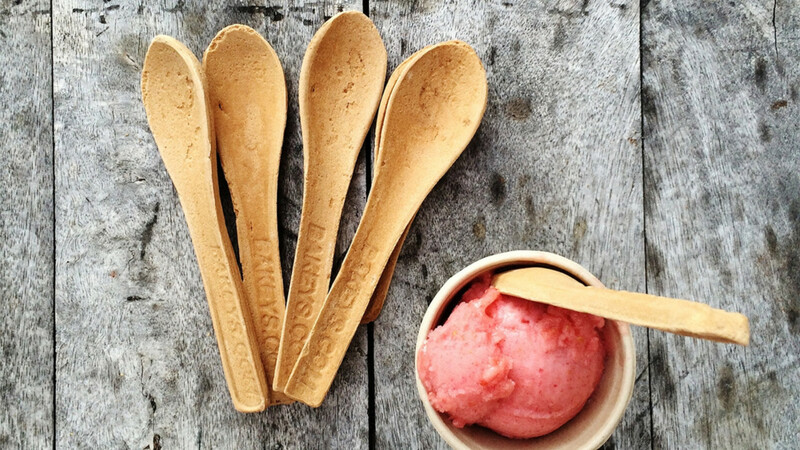 Well, in order to combat the increasing problem of waste created by plastic utensils, Indian company, Bakeys has come up with a unique solution – edible cutlery. Talk about an innovative packaging solution and how! They make their spoons by kneading a mixture of rice, wheat and sorghum flours with hot water and baking it thereafter. Not only are the spoons biodegradable and vegan but owing to Sorghum’s resilient qualities they don’t get soggy in soup either. As far as food is considered, Seaweed extract, Agar is widely used in various food products as a thickening agent and a gelatine replacement. However, its application as a packaging material is a relatively new phenomenon. Well, that’s exactly what Indonesia-based Evoware has managed to achieve. In order to combat the problem of one-use plastic, this start-up has come up with an edible seaweed packaging to serve as a plastic replacement! Evoware’s creation is food tested which means if you fancy a nibble at it, go for it! Why specifically Seaweed though? It is biodegradable and a natural plant fertilizer. Further, it absorbs carbon dioxide from the air while it grows. There’s more – it doesn’t require any fertilizers or water to grow, making it an extremely sustainable produce. While Vegan packaging has been a topic of discussion for a while now, it is only now that it is emerging in its true glory. For a long time now, it has been believed that the future of food is plant-based. May we dare say that the future of packaging too could be plant-based? !